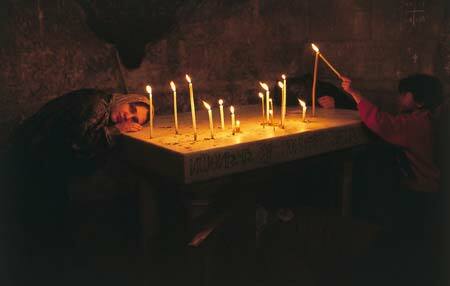 "On Holy Saturday believers gather in great crowds in the Church of the Holy Sepulchre. For on this day fire comes down from Heaven and puts fire on lamps in the church." This ceremony, described above by one of the many pilgrims visiting Jerusalem during Easter, has occurred yearly for centuries and includes the unexplainable event of the Holy Fire igniting candles and oil lamps. Orthodox Christians cherish it as the greatest of miracles and see it as a continuous reminder of the Lord's resurrection. The author and his companions travelled to Israel to be present at this ceremony and to speak to some of the persons who have witnessed the miracle and whose lives it has inspired. The ceremony of the Holy Fire has taken place ever year for nearly fifteen centuries, at the same time, in the same manner, and at the same location. It draws ever-growing crowds of pilgrims to the Holy City each Easter season. The ceremony surrounding "The Miracle of the Holy Fire" appears to be one of the oldest recurring Christian ceremonies in the world. From the fourth century AD all the way up to our own time, sources recall the ceremony. The Church Historian, Eusebius, writes in his Vita Constantini which dates from around 328 about an interesting occurrence in Jerusalem of Easter in the year 162. When the churchwardens were about to fill the lamps to make them ready to symbolise the resurrection of Christ, they suddenly noticed that there was no more oil left to pour in the lamps. Upon this, Bishop Narkissos ordered the candles to be filled with water. He then told the wardens to ignite them. In front of the eyes of all present every single lamp burned as if filled with pure oil. The Orthodox Church believes that this miracle, which predates the construction of the Holy Sepulchre in the fourth Century, is related to the Miracle of the Holy Fire. They admit that the two differ, as the former was a one-time occurrence while the Miracle of the Holy Fire occurs every year. However, they have in common premise that God has produced fire where there logically speaking should have been none. Around 385 Etheria, a noble woman from Spain, traveled to Palestine. In the account of her journey, she speaks of a ceremony by the Holy Sepulchre of Christ, where a light comes forth (ejicitur) from the small chapel enclosing the tomb, by which the entire church is filled with an infinite light (lumen infinitum). It is not clear, whether her words refer to an alleged miraculous occurrence or to the bishop, who emerged from the tomb with the flame, possibly ignited from a perpetual flame inside the sepulchre chapel. Things become clearer in an itinerary written by a monk named Bernhard after his journey to Jerusalem in the year 870. He describes an angel who came down after the singing of the "Kyrie Eleison" and ignited the lamps hanging over the burial slab of Christ, whereupon the Patriarch passed the flame to the bishops and to everyone else in the church. In 926 the Arabic historian Ma'sûdi travelled to Palestine, and his account describes a similar event: on Easter Saturday Christians gathered from the entire country at the sepulchre, as on that particular day fire came down from heaven igniting the candles of those present. "The Chapel with the tomb where the fire first proceeds." 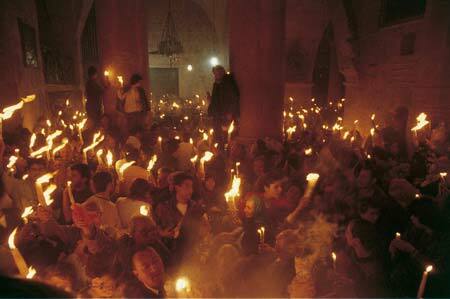 Different sources reveal varying practices around the ceremony of the Holy Fire. Ancient and modern sources alike relate that pilgrims see the fire not only inside the Holy Sepulchre but also in Saint James Church next to the sepulchre itself, although the basic elements of the miraculous ignition of candles remain the same. The Russian abbot Daniel, in his itinerary, written in the years 1106-07, presents the "Miracle of the Holy Light" and the ceremonies that frame it in detail. According to Daniel, the night before the miracle, churchwardens cleaned the church and all the lamps inside it. They then filled the lamps with pure oil and left them darkened. "the Greek lamps being there where the head lay, and that of Saint Sabas and all the monasteries in the position of the breast." While the doors remained sealed, the entire church waited for the Holy Fire. The next day, after the fire had come, the "Bishop, followed by four deacons, then opened the doors of the Tomb and entered with the taper of Prince Baldwin so as to light it first with the Holy Light". Daniel concludes, "We lighted our tapers from that of the Prince, and so passed on the flame to everyone in the church". It appears that during some vigils pilgrims waited for hours for the fire to come, as it did not always appear at the same hour. Thus Theoderich, who wrote his account in 1172, says that sometimes the Holy Fire appeared about the first hour, sometimes about the third hour, the sixth, the ninth hour, or even so late as the time for Compline. Also Theoderich-admits that the fire would appear first in a variety of places-sometimes in the Holy Sepulchre, sometimes in the Temple of the Lord, and sometimes in the Church of St. John outside the Holy Sepulchre itself. 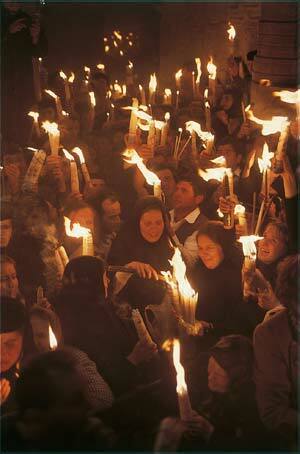 "Orthodox Christians have celebrated the ceremony of the Holy Fire for many centuries. It is considered the greatest of miracles." The number of similar testimonies have increased along with the growing number of pilgrims going to the Holy Land, producing in an uninterrupted flow of first-hand accounts right to our times. However, the report written by the English chronicler, Gautier Vinisauf, deserves special attention as it relates a very interesting anecdote about the ceremony as it occurred in the year 1192. In 1187, the Saracens under the direction of Sultan Salah ad-Dîn took Jerusalem. In that year, the Sultan desired to be present at the celebration, even though he was not a Christian. Gautier Vinisauf tells us what happened: "On his arrival, the celestial fire descended suddenly, and the assistants were deeply moved. He caused it to be extinguished a second time and a third time, but it relit as of itself. Thereupon, the Sultan confounded cried out in prophetic transport: 'Yes, soon shall I die, or I shall lose Jerusalem.' This prophecy was accomplished, for Salah ad-Dîn died the following Lent." But what exactly happens in the Holy Sepulchre Church on Easter Saturday? Why does it have such an impact on the Orthodox tradition? And why does it seem as if nobody has heard anything about this miracle in Protestant and Catholic countries when it in many ways is more stunning than many Western miracles ? In fact, the miracle still occurs today in the Church of the Holy Sepulchre in much the same manner as medieval sources reported it. It is no coincidence that millions of believers consider this the holiest place on earth: theologians, historians and archaeologists believe it includes both Golgotha, the little hill on which Jesus Christ was crucified, as well as the "new tomb" near Golgotha that received Christ's dead body, according to the Gospel account. It is on this same spot that Christ rose from the dead. Since Constantine the Great built The Holy Sepulchre Church in the middle of the fourth century, the church has been destroyed many times. The Crusaders constructed the church that we see today. Around Jesus' tomb was erected a little chapel with two rooms, one little room in front of the tomb and the tomb itself, which holds no more than four people. It is this chapel that is the centre of the miraculous events. Being present at the celebration fully justifies the term "event," for on no other day of the year is the Holy Sepulchre Church so packed than on Orthodox Easter Saturday. If one wishes to enter it, one has to reckon with six hours of queuing, and each year hundreds of people cannot enter because the crowds are so large. Pilgrims come from all over the world, the majority from Greece, but in recent years increasing numbers from Russia and the former Eastern European Countries have also come. In order to be as close to the tomb as possible, the pilgrims camp around the tomb-chapel on Good Friday afternoon in anticipation of the wonderful event on Holy Saturday. The miracle happens at 2:00 PM, but by 11:00 AM the Church is bustling with activity. 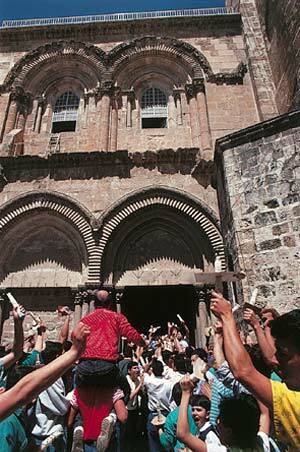 Every year, small fights occur between the different groups of Christians in the Church. If one finds no other reason why Christians ought to seek greater unity it would be enough to go to Jerusalem for the ceremony of the Holy Fire to observe the confusion and lack of peace that reigns in the Holy Sepulchre among the many Christian denominations present. dance according to their custom at the ceremony." From around 11:00 AM till 1:00 PM, the Christian Arabs sing traditional songs in loud voices. These songs date back to the Turkish occupation of Jerusalem in the 13th Century, a period in which Christians were not allowed to sing their songs anywhere but in the Churches. "We are the Christians, this we have been for centuries and this we shall be for ever and ever, Amen!" they sing at the top of their voices, accompanied by the sound of drums. The drum-players sit on the shoulders of others who dance ferociously around the Sepulchre Chapel. But at 1:00 PM the songs fade out, leaving silence-a tense and loaded silence electrified by the anticipation of the manifestation of God that all are waiting to witness. "Every year Israeli authority check the tomb so it does not conceal any lights, whereafter it is sealed until the arrival of the patriarch." At 1:00 PM a delegation of the local authorities elbows through the crowds. Even though these officials are not Christian, they are part of the ceremonies. In the times of the Turkish occupation of Palestine they were Moslem Turks; today they are Israelis. For centuries the presence of these officials has been an integral part of the ceremony, as their function is to represent the Romans in the time of Jesus. The Gospels speak of Romans that went to seal the tomb of Jesus, so his disciples would not steal his body and claim he had risen. In the same way the Israeli authorities on this Easter Saturday come and seal the tomb with wax. Before they seal the door it is customary that they enter the tomb to check for any hidden source of fire, which could produce the miracle through fraud. Just as the Romans were to guarantee that there was no deceit after the death of Jesus, likewise the Israeli Local Authorities are to guarantee that there will be no trickery in the year 2000. The Patriarch enters and encircles the tomb chapel three times in procession. After the tomb has been checked and sealed, all people in the Church chant the Kyrie Eleison. At 1:45 PM the Patriarch enters the scene. In the wake of a large procession holding liturgical banners, he circles the tomb three times and then stops in front of its entrance. Then he takes off his royal liturgical vestments, leaving upon himself only his white alba as a sign of humility and respect in front of the portent of God that he is about to witness. All the oil-lamps have been blown out prior to the ceremony, and now all remains of artificial light are extinguished, so that the Church is enveloped in darkness. Holding two large unlighted candles, the patriarch enters the Chapel of the Holy Sepulchre - first into the small room in front of the tomb and from there into the tomb itself. To understand what happens when the patriarch enters the inner room, we need to hear his personal testimony. The following testimony is that of His Beatitude, Pattiarch Diodorus I.
Greek-Orthodox leaders who first receive the flame. 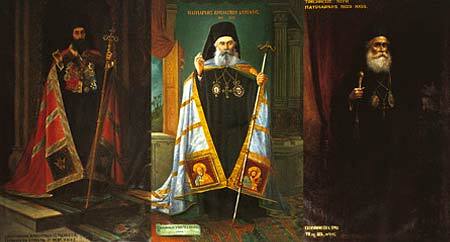 His Beatitude Patriarch Diodorus I was born in 1923. He first came to Jerusalem in 1938 and assisted the Miracle of the Holy Fire ever since. In 1981 he was elected Patriarch and was thus the key witness to the Holy Fire 19 times until his death in December 2000, as the Greek-Orthodox patriarchs always enter the little tomb chapel where the flame first occurs. 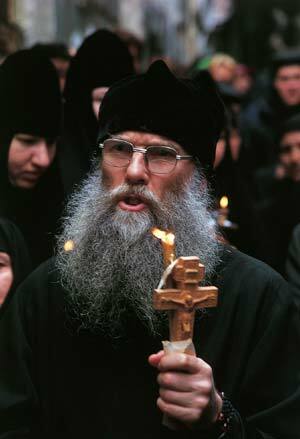 I spoke with him at the Orthodox Easter, 2000. His Beatitude Diodorus I during interview with the author. "Your Beatitude, what actually occurs when you enter the tomb on Holy Saturday during the ceremony of the Holy Fire?" "After all the lights are extinguished, I bow down and enter the first chamber of the tomb. From here I find my way through the darkness to the inner room of the tomb where Christ was buried. Here, I kneel in holy fear in front of the place where our Lord lay after his death and where he rose again from the dead. Praying in the Holy Sepulchre in itself for me is always a very holy moment in a very holy place. It is from here that he rose again in glory and spread his light to the world. John the Evangelist writes in the first chapter of his gospel that Jesus is the light of the World. Kneeling in front of the place where he rose from the dead, we are brought within the immediate closeness of his glorious resurrection. Catholics and Protestants call this church "The Church of the Holy Sepulchre." We call it "The Church of the Resurrection". The resurrection of Christ for us Orthodox is the centre of our faith, as Christ has gained the final victory over death, not just his own death but the death of all those who will stay close to him. "I believe it to be no coincidence that the Holy Fire comes in exactly this spot. In Matthew 28:3, the Gospel says that when Christ rose from the dead, an angel came, dressed all in a fearful light. I believe that the intense light that enveloped the angel at the Lord's resurrection is the same light that appears miraculously every Easter Saturday. Christ wants to remind us that his resurrection is a reality and not just a myth; he really came to the world in order to offer the necessary sacrifice through his death and resurrection so that man could be re-united with his creator. "In the tomb, I say particular prayers that have been handed down to us through the centuries and, having said them, I wait. Sometimes I may wait a few minutes, but normally the miracle happens immediately after I have said the prayers. From the core of the very stone on which Jesus lay an indefinable light pours forth. It usually has a blue tint, but the colour may change and take on many different hues. It cannot be described in human terms. The light rises out of the stone as mist may rise out of a lake - it almost looks as if the stone is covered by a moist cloud, but it is light. This light behaves differently each year. Sometimes it covers just the stone, while other times it gives light to the whole sepulchre, so that people who are standing outside the tomb and look into it see the tomb filled with light. The light does not burn - I have never had my beard burnt in all the sixteen years I have been Patriarch in Jerusalem and have received the Holy Fire. The light is of a different consistency than the normal fire that burns in an oil-lamp. "At a certain point the light rises and forms a column in which the fire is of a different nature, so that I am able to light my candles from it. When I thus have received the flame on my candles, I go out and give the fire first to the Armenian Patriarch and then to the Coptic. Thereafter I give the flame to all people present in the Church." "The Patriarch proceeds from the tomb with the ignited candles." "How do you yourself experience the miracle and what does it mean to your spiritual life?" "The miracle touches me just as deeply every single year. Every time it is another step towards conversion. For me it is of great comfort to consider Christ's faithfulness towards us, which he displays by giving us the holy flame every year in spite of our human frailties and failures. We experience many wonders in our churches, and miracles are nothing strange to us. It happens often that icons cry, when Heaven wants to display its closeness to us; likewise we have saints, to whom God gives many spiritual gifts. But none of these miracles have such a penetrating and symbolic meaning for us as the Miracle of the Holy Fire. The miracle is almost like a sacrament. It makes the resurrection of Christ as real to us as if he had died only a few years ago." After the Patriarch passes the fire to the Armenian and Coptic metropolitans, they in turn pass it through holes in the walls of the tomb chapel to runners who are ready to carry it swiftly to the various quarters of the denominations in the church. Thus, the fire spreads like brush-fire. While the patriarch remains inside the chapel kneeling in front of the stone, outside the tomb it is dark but far from silent. One hears a rather loud mumbling, and the atmosphere is very tense. When the Patriarch finally emerges with the lit candles shining brightly in the darkness, a roar of jubilee resounds in the Church. As with any other miracle, the Miracle of the Holy Fire is a matter of faith and conviction, and there are those, both non-orthodox and Orthodox, who do not believe it actually happens. Both Greek and Latin authors have proposed the idea that the miracle is fraud and nothing but a masterpiece of Orthodox propaganda. They suggest that the Patriarch has a lighter or matches inside of the tomb and lights his candles himself. Such understandable criticism is, however, are confronted with a number of problems. Matches and other means of ignition are recent inventions. Not many decades ago, lighting a fire was an undertaking that lasted much longer than the few minutes during which the Patriarch is inside the tomb. One could suggest that he had an oil lamp burning inside, from which he kindled the candles, but the Israeli authorities always have confirmed that they have checked the tomb and found no light inside it. The best arguments against fraud, however, are not the testimonies of the various patriarchs but the thousands of independent pilgrims who during the centuries have written of how they saw the blue light outside the tomb spontaneously lighting the candles in front of their eyes without any possible explanation. Often closed oil-lamps hanging in different places in the church beyond the reach of the pilgrims caught fire by themselves. And the person who experiences the miracle at close range, seeing the fire igniting the candle or the blue light swaying through the church, usually leaves Jerusalem changed. For many pilgrims I spoke to who attended the ceremony, there was a "before and after" the Miracle of the Holy Fire. "Pilgrims express profound joy over the yearly arrival of the Holy Fire." Several books have been written in Greek containing testimonies of those who experienced the miracle. However, none of these contain testimonies from recent decades. Archbishop Alexios of Tiberias (Italiano Tiberiade) has taken upon himself this task of collecting more current testimonies from pilgrims who had miraculous experiences during the ceremony of the Holy Fire. During four years, he has gathered these testimonies, signed by the pilgrims, and his aim is to publish these in the near future. 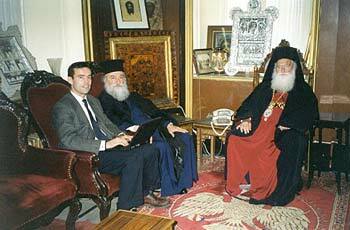 Archbishop Alexios, who has participated in the ceremony every year since 1967 decided to do this work after an experience related to the Holy Fire in 1996. 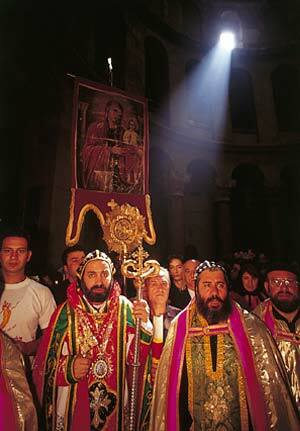 "Archbishop Alexios of Tiberias who participated at the ceremony for over 35 years. "After the ceremony, I went home to my apartment situated in the Greek Orthodox Patriarchate, up the hill west of the Holy Sepulchre", he explains. "From here I looked out of my window, and suddenly I saw a great luminous red cross over the Dome of the Holy Sepulchre. I blinked my eyes and looked again, yet the cross remained. I rushed on to the roof of the house, thinking the cross might be the product of the sun's reflections in the golden cross standing on the roof. However, once I had arrived on the dome, I saw the same phenomenon that I had seen from the window: Many meters above the dome's golden cross, another cross of red light was hovering, extending its rays far beyond the dome itself. "This experience was very profound for me," Archbishop Alexios continues. "I have assisted at the ceremony since I was young and seen and experienced many unexplainable things there. But this sign was so clear that I today can never doubt God's miraculous interventions. If people say they don't believe in the Miracle of the Holy Fire, I am not the one to try to correct them, but I know they are wrong." Metropolitan Vasilis, Delegate of Jerusalem Greek Orthodox Patriarch Diodorus I, confirms Archbishop Alexios' affirmation. "I have been in Jerusalem since 1939 when I came to the city at the age of fifteen. I have attended the ceremony of the Holy Fire during all these years, and have thus been a witness to the miracle 61 times. For me it is not a question of whether I believe in the miracle or not. I know it is true. Like many other believers, I testify that the Holy Fire does not burn. Many times I passed the Holy Flame under my beard it was not burned. 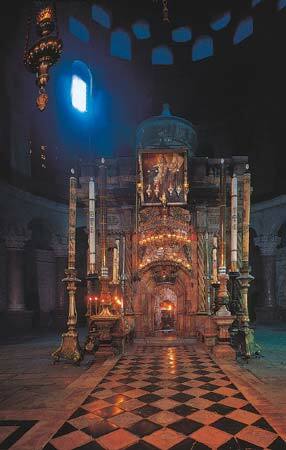 Year after year, I have seen the immediate and spontaneous lighting of the candles that the believers held enclosed in their hands, and I have heard many testimonies of people who either had their candles lit or saw the miraculous flame as it passed through the church of the Holy Sepulchre. To me the miracle is very important, especially as a memorial of the resurrection of Our Lord. The Holy Bible says that when the Lord rose from the dead, his tomb was bright, shining as if it were day. I believe it is in memory of this most central element of our faith that the Lord gives this marvelous sign, and so that it may never be forgotten!" "The flame is received with the same enthusiasm every year. Each year, pilgrims have reported to have seen the blue flame moving and acting freely, igniting closed candles and oil lamps in the Church. Mr. Souhel Thalgieh, a young engineer from Bethlehem, is another witness. Mr. Thalgieh has been present at the ceremony of the Holy Fire since his early childhood. In 1996 he was asked to film the ceremony from the balcony of the dome of the Church. Present with him on the balcony were a nun and four other believers, including the mother of Metropolitan Timothy. The nun stood at the right hand of Thalgieh. On the video one can see how he aims the camera down down at the crowds. 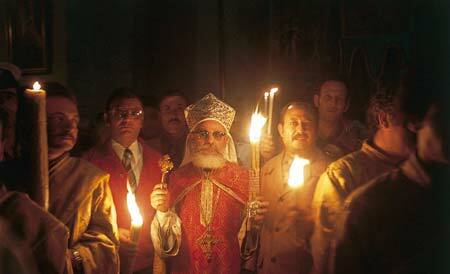 At the designated moment, all lights are turned off and the Patriarch enters the tomb to receive the Holy Fire. While the Patriarch is still inside the tomb one suddenly hears a scream of surprise and wonder originating from the nun standing next to Thalgieh. The camera begins to shake, and one hears the excited voices of the other people present on the balcony. The camera then turns to the right, capturing the cause of the emotion: A large candle, held in the hand of the Russian nun, caught fire in front of all people present apparently before the patriarch came out of the tomb. With shaking hands she holds the candle while over and over making the sign of the Cross in awe of the portent she has witnessed. "Orthodox pilgrims consider the flame a great treasure". In another of the many testimonies, Archimedes Pendaki of Athens, Greece, reports that the experience of the miracle became the impetus that eventually led him to become an Orthodox priest. Father Pendaki experienced the miracle in 1983. In the preceeding years, he had drifted further and further away from the Orthodox faith of his family, and only rarely did he enter a church. His mother, who was very religious, convinced him after much arguing to come to Jerusalem and witness the Miracle of the Holy Fire. While mother and son were standing in the Holy Sepulchre Church it so happened that the candle of Pendaki's mother lighted spontaneously before their eyes. Archimedes at first raged at her, accusing her of trickery to make him believe, but deep inside he knew very well that she would never invent such a thing. Furthermore she was not able to produce the portent herself. The event continued to disturb his thoughts until he could not ignore it any more, and the need to explore the faith of his youth in depth led him to the Holy Mountain of Athos. After some years, he decided to become a priest. In the year 2000, the blue flame again lighted the candles of many people. 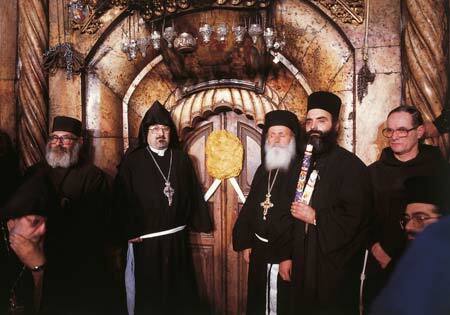 According to Archbishop Alexios, a monk was standing close to the door of the sepulchre. While the patriarch was still inside the tomb, the monk received the flame on his candle to the great astonishment of the people standing around him. From his candle, the fire spread on the side of the tomb. A young man from the Greek island of Rhodos testified that he saw the fire coming as a cloud above the monk, descending to light his candles. The Orthodox Christians are not the only ones to associate light with the presence and activity of God. In the Biblical writings, light often accompanies great miraculous works of God. About Moses' meetings with God on Mount Sinai the Bible says: "Mount Sinai was entirely wrapped in smoke, because Yahweh had descended on it in the form of fire. The smoke rose like smoke from a furnace and the whole mountain shook violently" (Ex 19,18 ff). Later in Exodus, it says: "To the watching Israelites, the glory of Yahweh looked like a devouring fire on the mountain top" (Ex 24,17). After Moses had stood face to face with God, his face shone so powerfully that he had to cover it, lest the people get hurt (Ex 34,29 ff). When Jesus was transfigured in front of the disciples on Mount Tabor, "the aspect of his face changed and his clothing became sparkling white" (Lk. 9,29). Likewise, after Jesus' resurrection, the women met by the grave "two men in brilliant clothes" (Lk 24,4). Light and the mighty works of God go hand in glove. "The fire is considered holy." The Church Fathers considered light to be a symbol of God, especially of God's love. Thus Gregory the Great (530-604) writes: "God is called light because he embraces the flames of his love-the souls in which he abides." In the same way, Orthodox Christians consider the Miracle of the Holy Fire a manifestation of God's power and of His presence. "We believe the flame to be holy", says Archbishop Alexios, "almost as a sacrament, ontologically related directly to God himself. The pilgrims move their hands back and forth over the flame and caress their faces with the hands that touched the flames." The miracle is important not only to the individual Christians whose faith it strengthened, but also because it plays a very important ecumenical role. The ceremony takes place every year on the Orthodox Easter Saturday and is celebrated together with all the Orthodox Christian communities. There are many types of Orthodox Christians: Syrian, Armenian, Russian and Greek Orthodox as well as Copts. In the Holy Sepulchre Church alone there are seven different Christian Denominations, and all, except the Catholics, take part in the ceremony. The Orthodox Easter date is fixed according to the Julian Calendar, which means that their Easter normally falls on a different date than the Protestant and Catholic Easter which is determined by the Eurpoean Gregorian calendar. Thus in the year 2000 the Orthodox Easter fell one week after the Easter of the West. Since the schism between East and West in 1054 the "Two lungs of the Body of Christ," as Pope John Paul II describes the Orthodox and Catholic communities, have lived separate existences. But for the first two hundred years after the schism, the Miracle of the Holy Fire had such unifying power that it gathered Catholics and Orthodox to celebrate the event together despite their differences. Only after 1246, when Catholic Christians left Jerusalem with the defeated Crusaders, did the Miracle of the Holy Fire become a purely Orthodox ceremony as the Orthodox remained in Jerusalem even after the Turks' occupation of Palestine. Metropolitan Timothy, who was the Patriarchate's representative to the recent ecumenical celebration of the opening of the Holy Doors of Saint Paul's Cathedral in Rome, said to me that the ecumenical and unifying power of the Holy Fire is quite exceptional. "Until the thirteenth Century the entire church celebrated the ceremony of the Holy Fire," he says. "Even after the Catholics left Jerusalem with the crusaders it has remained a unifying ceremony for those of us who stayed here, that is, for all the different branches of the Orthodox world. 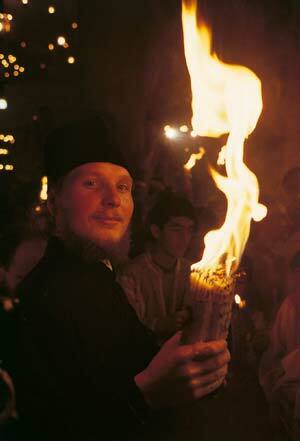 "The ceremony of the Holy Fire gathers representatives from all the Orthodox communities." 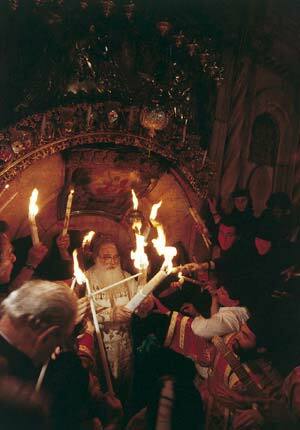 "The flame first comes in a miraculous way from Christ to the Greek Orthodox Patriarch inside the Tomb. He gives it to the Armenian and Coptic metropolitans, who hand it on to the remaining communities and they in turn, spread it to their own people. 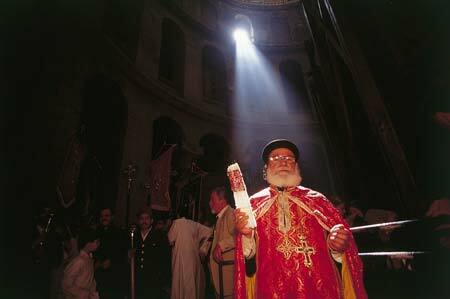 "From them it passes beyond the Holy Sepulchre to every corner of the Orthodox world. After the ceremony is over, believers from all Israel and Palestine carry it to the homes of their relatives. Pilgrims who come from far away make provisions, buying special oil-lamps with which they carry the flame to their countries. 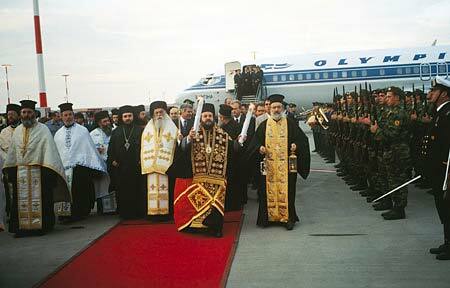 Olympic Airways helps the Orthodox to distribute the flame to many countries, especially to Alexandria in Egypt and to Russia, but also to Georgia, Bulgaria, and the USA. Each year we write letters of recommendation to the Israeli Ministry of Religious Affairs, which in turn assist pilgrims who carry the lanterns with the Holy Fire through customs and into their respective aircrafts. This is how important the spreading of the flame is to us. It is holy, and it keeps reminding us of how the one Holy Spirit is present in all the parts of the Body of Christ. Like blood being pumped by the heart into all members of a body, so the fire spreads from Jerusalem to all parts of the Orthodox community, reminding the faithful of the origins and unity of their faith. It has a tremendous unifying power to the Orthodox communion," Metropolitan Timothy concluded. and is received with the honours of a statesman." One might ask the question why the Miracle of the Holy Fire is hardly known in Western Europe. In the Protestant areas it may be explained by the fact that there is little traditional teaching regarding miracles; people don't really know how to approach them, and they don't take up much space in newspapers. The Catholic Church, however, has a long tradition of miracles, so why is the Miraculous Fire not better known amoung Western Catholics? One important reason may be that the ceremony is performed only by Orthodox Christians, on the Orthodox Holy Saturday; hence, Christians of other communities may consider it an internal Orthodox affair. Also, apologetic motives could play a role. Some Orthodox might insist that the miracle occurs in the presence of Orthodox Christians because the Orthodox Church is the only legitimate Church of Christ in the world. This tendentious explanation would cause a certain uneasiness in Catholic and Protestant circles. 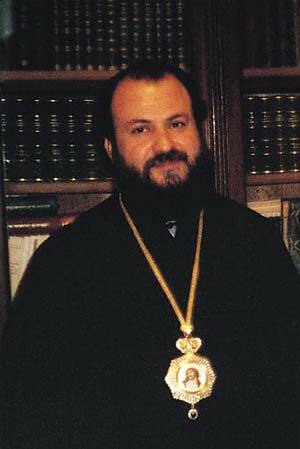 However, Archbishop Alexios disagrees with this stance: "The miracle does not prove anything of the sort. It is not a weapon of proselytism, creating division. It is not a proof that we are the only legitimate Christians. Rather, for us Orthodox, the miracle is a source of joy as it leads to greater unity in the Orthodox world, uniting us around this event. But not only this. I personally hope that the miracle can augment the awareness among Catholic Christians of how God is alive and active in the Orthodox Church, just as we are aware that he is present and active in the Catholic Church. Christ is one and works wonders for all his children. How I wish that this awareness of the oneness of Christ and his wondrous creativity would be an incentive towards full unity between us Christians." Klameth, Dr. Gustav. Das Karsamstagsfeuerwunder der heiligen Grabeskirche. Wien, 1913. Visit hvidt.com. Purchase it on Gyldendal.dk. See Swedish Edition. © Niels Christian Hvidt 2007. All rights reserved.